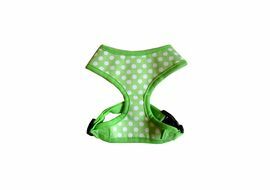 These printed cotton harnesses are designed and engineered to look your dog smarter than ever. 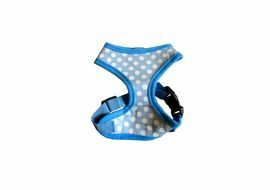 With easy and quick release buckle, the highly adjustable girth strap gives more control while walking your dog. The material is designed with high quality cotton durable enough to withstand everyday wear and tear. 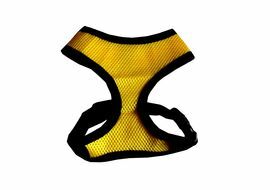 The sizing of these air mesh harnesses are designed as per international standards. 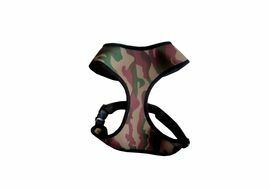 Available in two sizes: EXTRA LARGE (Neck – 42cm, Chest 57-80cm)Ideal for small to medium breed dogs like Large Pugs & cocker spaniels Please Note: The sizing of these air mesh harnesses are designed as per international standards. Although the size reads small or medium or large but it doesn't relate to the 'breed' of the dog. These are industry specific international sizings. 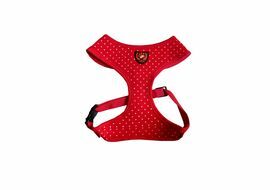 Please make appropriate measurement of your pet before making a purchase.ABOUT PUPPY LOVE: Puppy Love is one of the most premium brands in the division of pet accessories in India. The company manufactures some of the most gorgeous looking leashes, collars, personalized name engraved collars, pet foot care materials ranging from anti skid shoes to water proof socks, blankets and other cute stuffs. 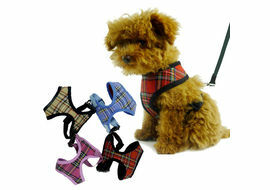 All items of Puppy Love give a scintillating look to your pet – as if they are dressed up for a party. The designs of Puppy Love are exclusively designed and finessed by pet lover Nirja Puri.Disclaimer: Apparels featured on petsGOnuts.com is highlighted with its sizes and other specification to help you choose the correct product for your pet. We recommend you to measure your pet before making your purchase. Any form of apparels be it Tshirt, socks or designer body harnesses once sold will not be replaced. We incur high charges to ship our product to different parts of India. Moreover a number of animals are prone to skin conditions and we believe it's unethical to sell the same stuff to another pet. Replacement of apparels cannot be done under any circumstances.